← Baci Di Fichi. Chocolate Dipped Figs With Roasted Hazelnut Crumbs Or Sea Salt Flakes. Happily I can report that Week One back on the 5-2 bandwagon was an overwhelming success, even after a long ten week hiatus. In the scheme of things, I’ve always found Mondays to be particularly easy; a welcome respite and something to look forward to after an inevitable weekend of unrestrained feasting. It’s the second fast day of the week, usually a Thursday, that’s hardest. Perhaps because it’s one more thing to fit into an already crowded week, with just one day’s leeway for any last minute rescheduling as I hurtle towards my always sacred fast free weekends. Here’s how that first week back panned out. As expected I sailed through Day One Monday. My meals were planned and prepared in advance, my resolve firm and unwavering. Yes, I turned in for the evening feeling a little hungry, safe in the knowledge the next day would be an unencumbered “feast” day allowing for any number of imagined indulgences. Tuesday dawned bright and completely devoid of any cravings. So much so that it wasn’t until mid morning I broke my fast with a light breakfast. And here is where it gets really interesting. Tuesday also happened to be our wedding anniversary with an eagerly anticipated dinner booked at one of our favourite restaurants. Feast we did, but not with my usual gay abandon. I was feeling uncharacteristically restrained. A wonderful degustation option was eschewed in favour of a la carte, and after just two courses I could only manage a shared dessert. Sated and replete, the following day, not Thursday as originally planned, became my second accidental fast day for the week. It wasn’t until 4pm late on Wednesday afternoon that I realised, apart from a morning cappuccino, not a bite had passed my lips. Incongruous but true, my Week One, Day Two fast day was well and truly aided and abetted by our celebratory dinner. With just 100 calories expended all day by my small 200ml whole milk cappuccino, and a whopping 400 calories to play with, this quickly became a fast day opportunity not to be passed up lightly. Dinner? 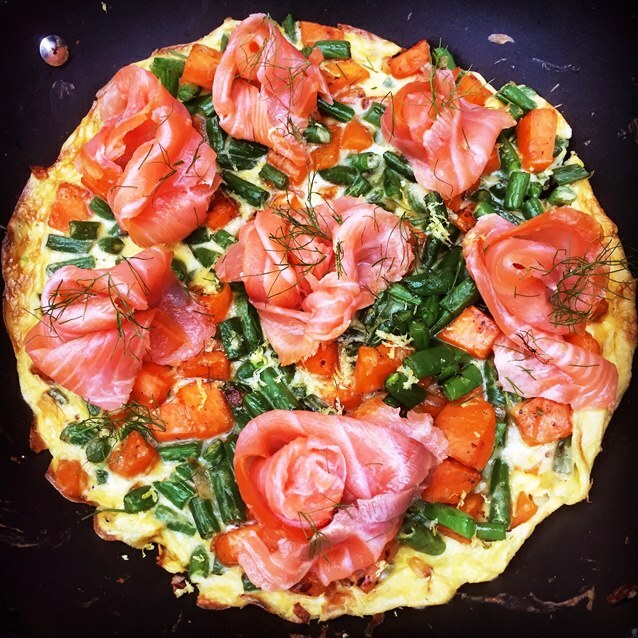 A family sized sweet potato and green bean frittata with smoked salmon curls. Substantial and satisfying for just 309 calories per serve. With the remaining 91 calories I was able to treat myself to a small slice of the sourdough bread, served as an accompaniment to the meal for the non fasting members of my family. Best of all, nothing could beat the sense of exhilaration and relief on Wednesday night that my fasting was done and dusted for the week. For anyone not feeding a family or looking for a smaller portion size, included at the bottom of the recipe is an option for individual frittatas baked in the oven in Texas muffin tins at just 155 calories per serve. These are suitable to freeze, drape over the salmon just before serving after frittatas have been thawed and reheated. HEAT oil in a heavy based 18cm non-stick ovenproof frypan over medium heat. add diced sweet potato. Sauté for about 7 minutes, until just tender. ADD green beans and continue to cook for a further 3 minutes. MEANWHILE whisk eggs until combined. Season with salt and freshly ground black pepper, and stir in grated cheese. ADD egg mixture to the pan, tilting the pan as you pour to ensure an even spread over the sweet potatoes and beans. REDUCE heat to low and continue to cook the frittata on the stovetop for 10-15 minutes until almost firm. REMOVE from stove and place under a hot grill for a few minutes until the frittata is golden-brown and puffed. REMOVE from grill, drape over smoked salmon slices, scatter over chopped dill and finely grated zest. Finish with a fresh squeeze of lemon. Serve. PREHEAT oven to 180°C. Grease 8 holes of two large texas muffin trays ( 3/4 cup capacity per hole), and line the bases of each hole with a circle of baking paper to ensure the frittata doesn’t stick. DIVIDE sautéed sweet potato and green bean mixture evenly into prepared muffin cups. Pour over egg mixture and bake for 20 minutes or so until golden brown and puffed. ALLOW to cool a little before removing from the tin. Drape each frittata with a little smoked salmon. Scatter over chopped dill and finely grated zest. Finish with a fresh squeeze of lemon. Serve. This entry was posted in Eggs, Seafood and tagged 5:2 Diet, Beans, Brunch, Eggs, Fast Diet, Frittata, Gluten free, Healthy, Smoked Salmon, Sweet Potato. Bookmark the permalink. 2 Responses to Eat, Fast and Live Longer. A 5-2 Fast Diet Recipe Idea Under 400 Calories. Sweet Potato And Green Bean Frittata With Smoked Salmon. Don’t know that I could manage back to back. I’m loving the idea of Wednesdays for a second fast day though. Will see how I go tomorrow.